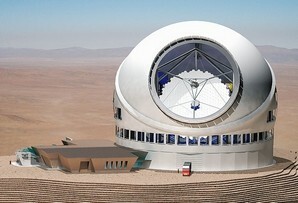 We’re liking this thought-proving post from journalist Anne Minard, on the “next great telescope race”–Day 14 of her “100 Days of Science.” She asks some great questions about the fundamental purpose of the two U.S. proposals for “next generation” giant land-based telescopes being proposed for construction within the next 10 years. Do we really need THIS much telescope, guys? Charles Alcock, director of the Harvard-Smithsonian Center for Astrophysics, acknowledged that the two telescopes are headed toward redundancy. The main differences, he said, are in the engineering. He said the next generation of telescopes is crucial for forward progress in 21st Century astronomy. And far from being a competition, the real race is to contribute to science, said Charles Blue, a TMT spokesman. “All next generation observatories would really like to be up and running as soon as possible to meet the scientific demand,” he said. But when I asked him why the United States teams haven’t pooled their expertise to build a single next-generation telescope, Blue declined to comment. In all, there are actually three teams (two from the U.S., and one from Europe) racing to build the first of these giant land-based telescopes: Extremely Large Telescope (Europe), TMT (U.S.), and Giant Magellan Telescope (U.S.). (And no, we’re not making these names up… in almost every description we could find, these bad boys are characterized first and foremost by their massive size.) The total estimated price tag for all this summit development? $2.6 billion dollars. In the midst of this competition to build the first and the largest, the worldwide community of those who share aloha for sacred summits are humbly asking: for time and real consideration for native ecosystems, threatened endemic species, the cultural meaning of sacred space, cultural practice, and the natural and cultural heritage we have to pass forward to next generations… all in short supply on earth today. Can we not rationally slow down this latest race for space, in the interest of the future of life on our own planet? While it is true that as long as there is no plan there is no TMT, that is not the desired outcome for the plan. We’re not trying to block the plan to stop TMT. What we do want is the opportunity to have a real plan–one that arises out of a transparent process and allows communities to articulate a public vision for the future of these extremely important public trust lands. That is what a public planning process is supposed to do. The point is that we have been denied the kind of critical, public and open discussion that would lead to such a plan. In its place, we are being told to shut up and accept a plan that was written by the university and driven by its interest in telescope development and telescope dollars. We have long said that we want a fair opportunity to talk through and determine together how astronomy and cultural practice and natural conservation coexist–in what form, by what rules, and with what limits–on the summit. This is not an unreasonable ask. The University is wasting precious public education dollars on motion after motion in this case, because they are unwilling to compromise in any way on their development plans. For the University, this case is all about TMT. 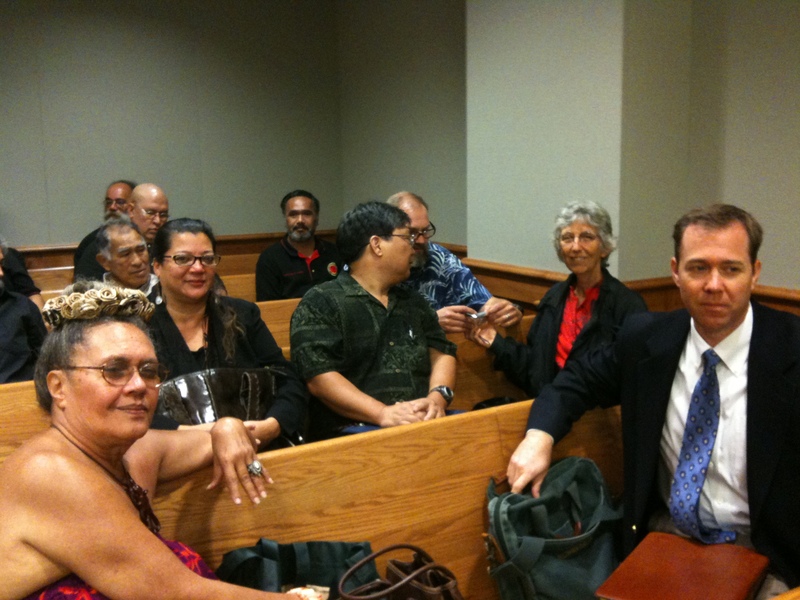 For advocates of the mountain, this case is not about TMT at all. It is about our standing, and the right of the people of Hawai’i to determine the future of a unique, irreplaceable summit that is part of Hawai’i’s public trust. Click here to read the article from the Hawaii Tribune Herald. Yesterday morning, the Third Circuit Court heard oral arguments on the University of Hawaii’s motion to dismiss our appeal for a contested case hearing on the University’s new management plan for Mauna Kea. Though we are still waiting for the judge’s ruling, the hearing made one thing clear: supporters of this “CMP” also support more telescopes (and more desecration and destruction) on the sacred summit. Less than a dozen people sign-waved outside the Hilo courthouse during the hearing with pre-printed signs that said “Mauna Kea TMT Yes!” If you ever doubted the connection between more telescopes and the University’s CMP, then yesterday’s demonstration of support for the “Thirty Meter Telescope” at a hearing on the CMP should make it clear that the University wrote this CMP to facilitate telescope construction on Mauna Kea. Indeed, the CMP does not speak to any limitations on telescopes or a carrying capacity for the summit. And, Mahalo Nunui!! This is just a little shout out to all of those who took time out of their workday to sit in solidarity with us before the judge. Mahalo for your unwavering support. Want to help? Click here to sign up for action alerts and receive regular court updates. And click over here to donate directly to the Mauna Kea Legal Defense Fund. The Hawaii Legislature is seriously considering a raid on our most important conservation funds in order to balance the state budget. This is insane given all that these few millions do to protect the quality of our drinking water, the health of our native ecosystems, and truly local jobs. But, the insanity goes a step further once you realize they are considering these massive cuts when the state is owed millions upon millions for the use of public land on Mauna Kea. For 40 years foreign-owned telescopes have used (and destroyed) acres of public land on the summit of Mauna Kea without paying any rent. Rent, that is required by state law! It’s estimated that the state could earn at least $50 million a year just by charging market-based rent for the use of our public lands, instead of giving it away to foreign corporations and countries… and cutting important programs and jobs to make ends meet. On Sunday, the Honolulu Advertiser published the editorial below from some of the entities that directly benefit from these important programs. If you would like to express your support for these programs to the Hawaii Legislature, click here. We thank The Advertiser for its editorial (April 2) on the necessity of natural resource stewardship even during fiscal crises. Generations of ranchers, farmers and land managers have always understood the close connection between a healthy natural environment, land protection, stewardship, water supply, agricultural self-sufficiency and the economy. Business and government often measure our economy by the number of tourism and construction jobs in operation. That’s understandable, but doesn’t account for vast natural assets (water, forests, beaches, coral reefs, agricultural land) that support every person in Hawai’i — residents and visitors — who depend on services from the environment for their livelihoods, health and welfare. The programs that are funded by the DLNR’s Natural Area Reserve Fund and the Land Conservation Fund are essential to the protection of our Hawaiian resources. They support watershed management, invasive species control, agricultural production, forestry, coastal protection and cultural preservation. Hundreds are employed and more than 1 million acres are managed, protected and cultivated for public benefit. These healthy, managed natural resources and the services they provide allow us the lifestyle we all enjoy and permit our survival in the middle of the vast Pacific. Due to difficult times, conveyance tax revenue that supports these funds is down 50 percent. These programs will be cut by half or more even without House Bill 1741. Further reduction in the NAR Fund and Land Conservation Fund as proposed in HB 1741 would either eliminate many of these essential programs or cripple them to the point of leaving them inoperable and nonfunctioning. These programs leverage funding by at least 1:1, and in some cases as much as 1:3, with federal, county and private dollars (i.e., for every state dollar spent, three additional matching non-state dollars can be leveraged). The NAR Fund and the Land Conservation Fund are our state’s way of supporting large-scale conservation that protects our incredible natural resources, supports sustainable land and water management, ensures high-quality jobs, and guarantees the perpetuation of essential ecosystem services worth billions of dollars. Without watershed management, critical drinking water resources will dry up or become contaminated. Without personnel in the field controlling invasive species, pests like bee mites will infiltrate our shores — wiping out industries like our local honey/beekeeping industry, or requiring tens of millions to control and eradicate (e.g., miconia, coqui frogs). Without land protection, more agricultural, watershed, forest, coastal and culturally important lands will be converted; reducing our ability to feed ourselves and attract visitors who appreciate Hawai’i’s natural beauty. Without these programs, successes like MA’O Organic Farms might not be possible. MA’O recently purchased agricultural land using Land Conservation Funds, allowing it to expand its organic farm, and employ over two dozen high school graduates from Wai’anae and Nanakuli and pay their college tuition and stipends. As fifth-generation ranchers in North Kohala, Kahua Ranch and its neighbors in the Kohala Watershed Partnership are using their resources and support from the NAR Fund to control invasive species and protect 65,000 acres of native forests and watersheds. With help from the NAR Fund’s Forest Stewardship Program, Hui Ku Maoli Ola will restore over 30 acres of land in Ha’iku valley. Keeping the NAR Fund percentage at 25 percent and the Land Conservation Fund percentage at 10 percent is a small investment for such large, sustainable and long-term benefits for our island communities. Herbert “Monty” Richards of Kahua Ranch, Gary and Kukui Maunakea-Forth of MA’O Organic Farms and Rick Barboza of Hui Ku Maoli Ola wrote this commentary for The Advertiser. education or desecration, your pick? Giant Telescope Eyes Site on Mauna Kea, front page of the Sunday Advertiser, as Senator Inouye proposes undefined “scholarships for Native Hawaiians” as mitigation for a proposed new two-acre observatory facility on the last pristine plateau of Mauna Kea. Mauna Kea is both ecologically unique and culturally sacred, and we know that telescope operation and construction have already had a significant impact, and that the UH Institute for Astronomy (UHIFA) have not done an adequate job of protecting the natural and cultural resources of the summit over the last 30 years of telescope development. The UHIFA also pays only $1 in lease monies to the people of Hawai`i for their use of the summit. In 1998, the Hawai’i State Auditor issued a report criticizing the UHIFA’s and BLNR’s management of Mauna Kea. The Auditor found that the UHIFA’s focus on telescope construction was “at the expense of neglecting the site’s natural resources.” Among the effects of the construction were: the damage or destruction of historic sites and Hawaiian family shrines; the destruction of the Wekiu Bug’s habitat; trash and construction debris left on the summit; and abandoned facilities and equipment. NASA already offered $1.85 million towards Native Hawaiian causes, a gesture that Native Hawaiians noted did not address the actual desecration of the mountain. The UHIFA has continually ignored the call of hundreds of Hawaiian citizens to halt further exploitation and development of Mauna Kea’s summit, and to assess cumulative damage to cultural and environmental resources before proceeding with future development. But an undefined amount in scholorships? Should totally smooth things over.